Of course he is talking about God. However, at the end he proposes that the real creation, or the one being designed, was God…for it is impossible for a deity this complex to occur of its own accord. So in essence, we are God; for only we can create His existence within our holy brain! Now this goes hand in hand with the age old question: which came first- the chicken or the egg? Or that wonderful AC/DC song- Who made Who? After reading his wonderful blog it really got me thinking about what I really believe? 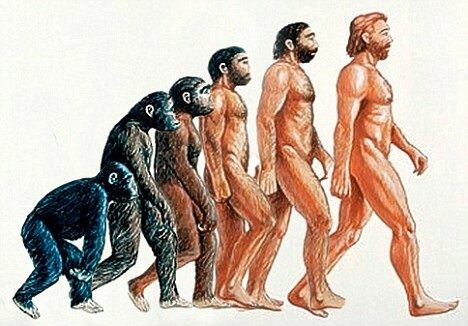 I finally came to the conclusion that I really do believe in Evolution! What a breakthrough! In my own personal process of Evolution it is my desire to know and be like God. Now because I could not easily relate or know God, He was kind enough to break into this world to give me a living example, in the form of Jesus Christ, to emulate. 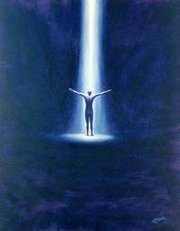 So when I took up my cross to follow/imitate Jesus, my physical, mental, and spiritual existence began its evolution towards a higher plane of existence. This process is ongoing, transcendent, and wonderful! It makes you see every living thing in a whole new way. The truth is: life had to be created. It is just too irreducibly complex to have occurred on its own. Yes, I could be of the mindset that we are nothing but primates…but that seems like backward thinking to me…or De-evolution if you will. Yes, evolution is true…and Jesus Christ is the evolutionary pinnacle.